Superstar Impression™ Custom Printed Folding Chairs | First Team Inc.
First Team introduces our Superstar Attitude lineup of custom printed folding chairs! 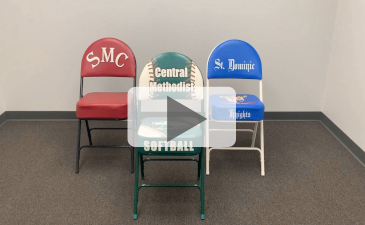 Show your school or company spirit with customized folding chairs. Steel chair frames can be built in your choice of 10 colors shown below. Choose your frame color, then supply artwork to be printed on chair cushions. First Team can print any image using our digital printing process at no extra charge. Digital printing allows for an infinite number of colors and designs. Printing is available up to three places; backrest, top of seat cushion and front of seat cushion. The heavy-duty steel frame is rated up to 400 pounds. Extra thick 3” foam seat cushion and large backrest make this the most comfortable chair on the market. Don’t settle for smaller chairs that use thinner foam and tiny backrest supports. The chair is upholstered using heavy duty 30 oz. tear resistant vinyl. Rubber cap leg tips protect the floor from scratches. For orders fewer than 20 chairs, a one-time artwork charge may apply. Let First Team show you why Superstar digitally printed chairs are quickly becoming America’s number one choice for customized seating.